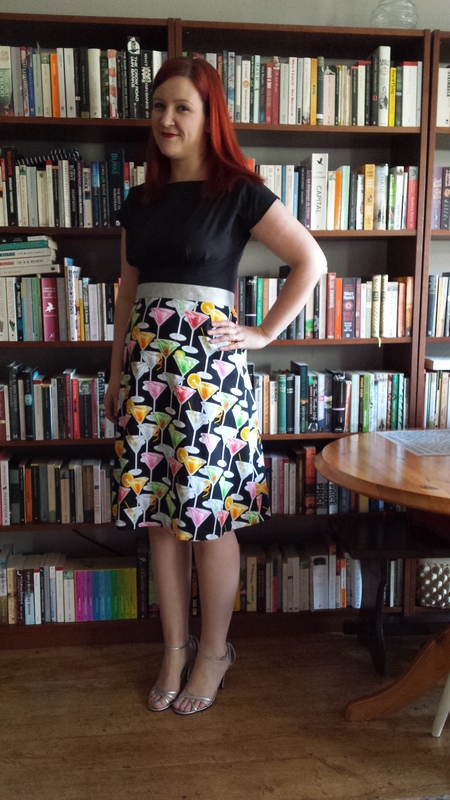 My March Minerva Make – Cocktail Dress! I am so pleased to be able to tell you all that I am one of the bloggers for the Minerva Blogger Network! It’s a huge privilege to work with Minerva Crafts, especially amongst such other talented sewing bloggers whom I admire greatly. Now I’ve got my geeky gushing out of the way, let me tell you about my first Minerva make! 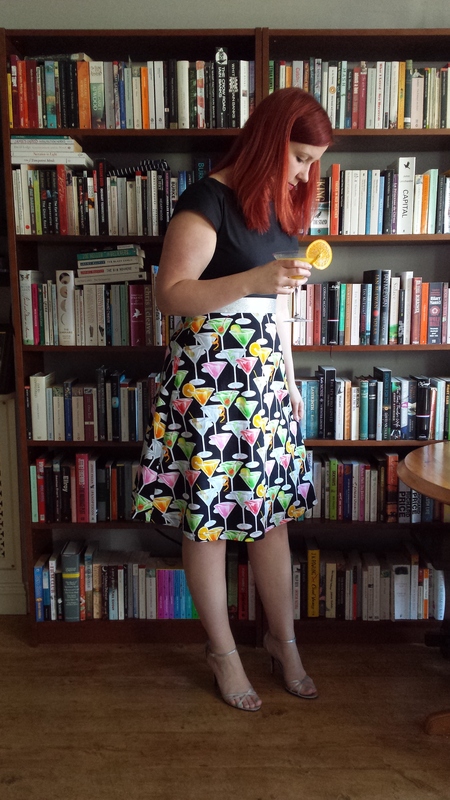 It’s a cocktail dress – or rather, a dress with cocktails on it! I saw this print and fell IN LOVE. As most of our readers will know (and certainly anyone who follows me on Twitter!) – I am partial to the odd cocktail and I have rather a well-stocked cocktail cabinet. I can often be seen sporting some sort of cocktail in my ‘outfit shots’, and I even blogged about all the different cocktails I made during my April Challenge last year (I even blogged the recipes!). Now, I realise this may make me sound like some sort of alcoholic, so I must just point out that I don’t actually drink that much – just the odd cocktail some evenings after a day of looking a baby and a pre-schooler. That’s reasonable, right?! 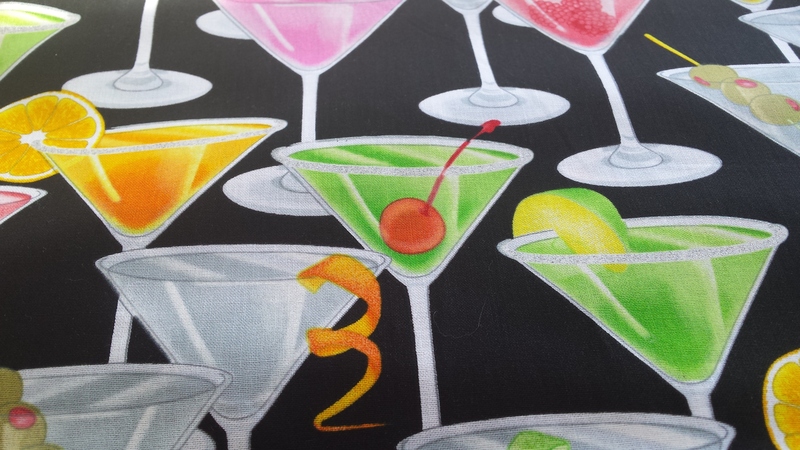 So, back to the dress… This fabric is by Timeless Treasures, and although it is described as ‘metallic’, don’t be put off by that, as all it means is that it has a tiny bit of glitter on the rims of some of the martini glasses to give a ‘frosted’ effect. It’s very subtle, and it also washed really well on its pre-wash. Win! Having already made the fabulous By Hand London Anna dress (like five times! ), I decided to use that pattern again as it meant that a) I wouldn’t mess up my first Minerva make and look like a big doofus and b) it’s quick and easy to sew and c) it looks pretty good with a plain bodice and contrast skirt. I didn’t want any seams on the skirt front, as I wanted to showcase the print of the fabric and I didn’t want to pattern match as the print has a pretty epic repeat. The Anna skirt just wasn’t right for this project, so I made my own skirt pattern using the half-circle skirt pattern I drafted when I made my Anna Map dress. (If you want to see my Anna Map dress, and/or how I drafted the full-circle skirt and half-circle skirt pattern, click here). However, that pattern still wasn’t going to fit my 1.5m of fabric, so I folded out some of the excess at the hem, and shortened it by a few inches, and, hey presto! New skirt pattern! I cut the skirt front on the fold and the back is two pieces to allow for a centre back zip. Half-circle skirt pattern, adapted to fit the fabric! Once I’d got my skirt pattern sorted, the construction of this dress was as simple as always. I overlocked the raw edges and the bottom of the facings, inserted a classic centred dress zip, and machine hemmed it, and added a metallic sparkly ribbon at the waist. Job done! 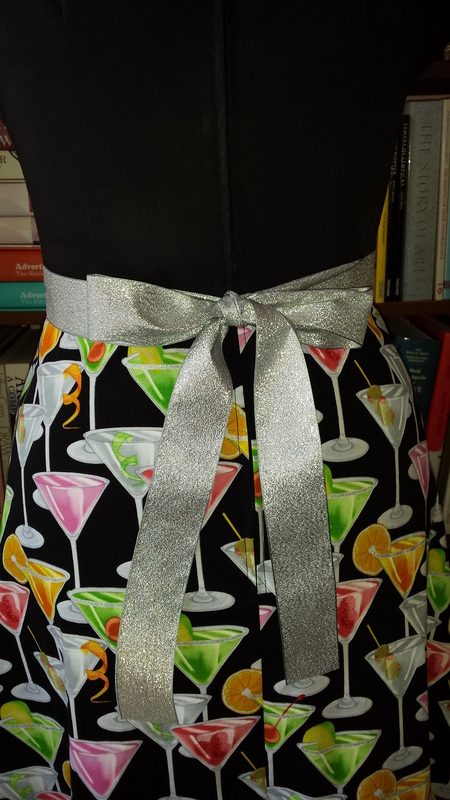 Back view – centred zip and sparkly ribbon! Here I am wearing the dress! Place the ice and all ingredients in the lower part of the shaker. Fit the upper part of the shaker and shake vigorously for 8-10 seconds. Strain into a martini glass using a cocktail strainer. Garnish with a slice of orange and serve immediately. 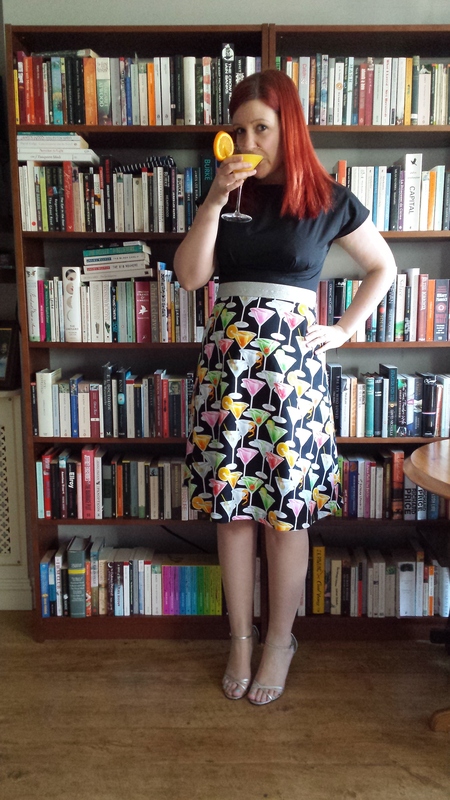 If you feel inspired to make your own cocktail-print dress or skirt, then you could start with my ‘kit‘ from Minerva. 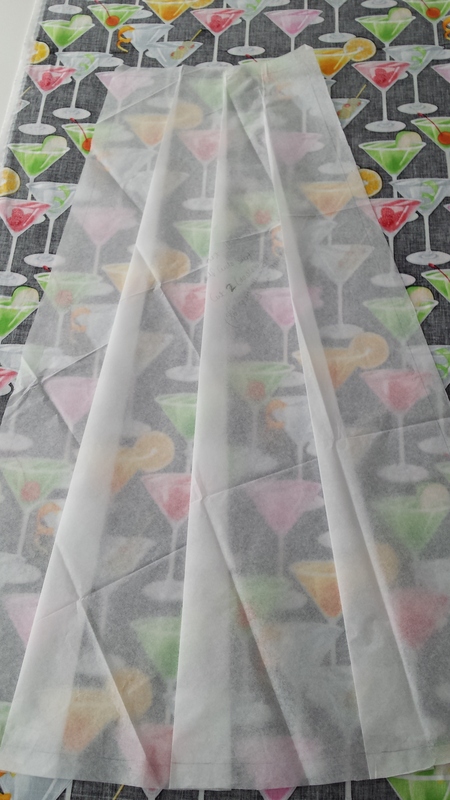 It contains 1.5m of the cocktail print fabric and a 22″ black dress zip. This would be enough fabric to make a simple skirt. If you wanted to make a dress, you need 1m of a black cotton such as this for the Anna bodice. The sparkly ribbon is, I think, identical to this one, and I used just under 2m of that. Hope you like my first Minerva make, I’m really pleased with it! Thanks Laurie! I hadn’t thought of it that way, but you’re right! Bloody gorgeous! Looking forward to seeing more of your Minerva makes. Thanks Jo! I’m looking forward to making them! Congratulations on being a Minerva blogger! And I love your cocktail dress! Thank you Lynne! I just need an occasion to wear it now! Hehe! I bought plain as well, but it just HAD to be sparkles! !